Several pathophysiological factors that are of significance for the prognosis of renal diseases can be assessed in the near future with specific MR techniques and contrast agents. These factors in acute renal diseases include cell viability, degree of glomerular or interstitial inflammation, and tubular dysfunction. In chronic renal diseases they include medullary hypoxia and development of glomerular or interstitial fibrosis. In ARF, direct toxicity to the cells or ischemic damage may lead to apoptosis or necrosis of tubular cells. Therefore, identification of these cellular events could help in assessing the severity and the reversibility of diseases. Several methods could be promoted, such as diffusion-sensitized sequences or MR-targeting of apoptotic cells. MR Diffusion of Acute Renal Diseases. SI observed on diffusion-weighted sequences depends on molecular movements within intra- and extracellular spaces, which depend essentially on local temperature and biological barriers present in the tissue (cellular membranes, fibers, organelles, macromolecules, etc.). In addition, "external" factors, such as perfusion, magnetic susceptibility of tissues, cardiac pulsations, and respiratory movements, influence this technique (55). The "external" factors are relatively well controlled within the brain but difficult to nullify in abdominal applications, particularly artifacts due to bowel peristalsis and respiratory movements. Technical details of MR diffusion imaging are beyond the scope of this chapter and have been discussed elsewhere (56). Using appropriate acquisition methods, cortical values of apparent diffusion coefficient (ADC) appear higher in the cortex than in the medulla (Fig. 10) (57). In acute renal disease, diffusion-weighted imaging could be useful to separate cellular edema from cellular necrosis, i.e., reversible versus irreversible renal damage. Reversible cellular edema is characterized by decreased ADC values, due to a reduction of the size of extracellular diffusion spaces and of the exchanges between intra- and extracellular spaces (so-called restricted diffusion). Irreversible cellular necrosis is characterized by increased ADC values because of destruction of cell membranes enlarging extracellular diffusion spaces. In an experimental model of diabetic nephropathy, we showed that the regional ADC values were decreased within the outer medulla when tubular cell edema occurred (58). However, the exact role of this method in evaluating prognosis of acute renal diseases has still to be defined. MRI of Apoptosis. Apoptosis and its regulatory mechanisms contribute to cell number regulation in ARF (59). Tubular cells apoptosis is promoted by both exogenous factors such as nephrotoxic drugs and bacterial products, and endogenous factors, such as lethal cytokines. Conversely to necrosis, which is a nonreversible process, apoptotic pathways are potentially accessible to therapeutic modulation (60). There is growing interest in using MRI for detection of apoptosis, mainly in the field of oncology and in ischemic diseases. This approach needs to label apoptotic cells using ultrasmall particles iron oxides (USPIOs) as markers and phosphatidyl-serine as a target. This requires to link the superparamagnetic nanoparticle with annexin V or synaptotagmin I, which both bind to the phosphatidylserine that appears on the outer leaflet of the plasma membrane of apoptotic cells (61). 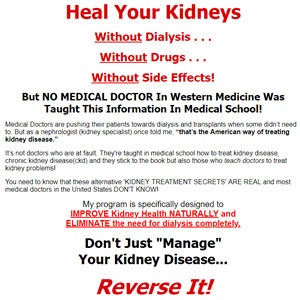 To our knowledge, this approach has never been applied to an ischemic kidney model. In ARF models, the primary site of renal injury whether in the proximal or distal part of the nephron remains uncertain (62). Using Gd-dendrimer chelates, which are cleared by GFR, some authors were able to demonstrate proximal tubule dysfunction in acute tubular damage induced by cisplatin in mice (63). This contrast agent accumulates within the outer medulla, where the proximal straight tubules are located (Fig. 11A). 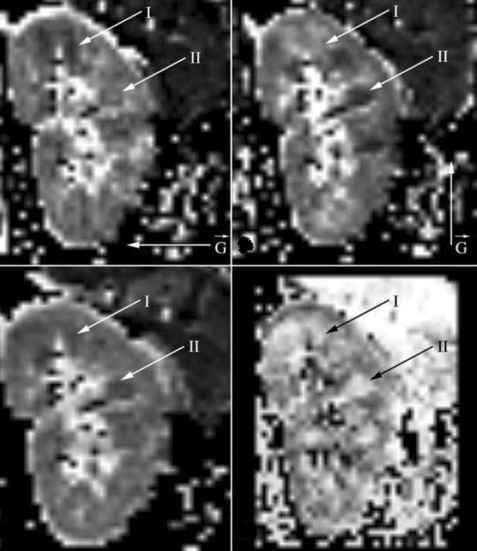 In diseased kidneys, the bright SI of the outer medulla does not show, and the gradation of tubular damage assessed by dynamic MRI correlates with renal function (Fig. 11B and C). Figure 10 Calculated ADC maps with a diffusion weighting in two orthogonal directions demonstrate the radial-shaped anisotropy of the medulla. The pyramid cell in the upper part of the kidney (I) shows a lower ADC with an applied diffusion weighting in the left-right direction (top left), while the ADC obtained in the superior-inferior direction is elevated (top right). The pyramid cell in the center part of the kidney (II) has a lower ADC in the superior-inferior direction, while the ADC in the left-right direction is elevated. On the ADCtrace maps (bottom left) both pyramids are clearly depicted as regions with a lower ADC than the cortical tissue, and on the FA map (bottom right) both regions can be identified by the elevated FA. Abbreviations: ADC, apparent diffusion coefficient; FA, fractional anisotropy. Source: From Ref. 57.